I must admit when I was asked if I'd like to review a Wonderbag (which I might point out I had never heard of before) I was intrigued. Can it really work, I mean really? Well the answer is, YES it does. 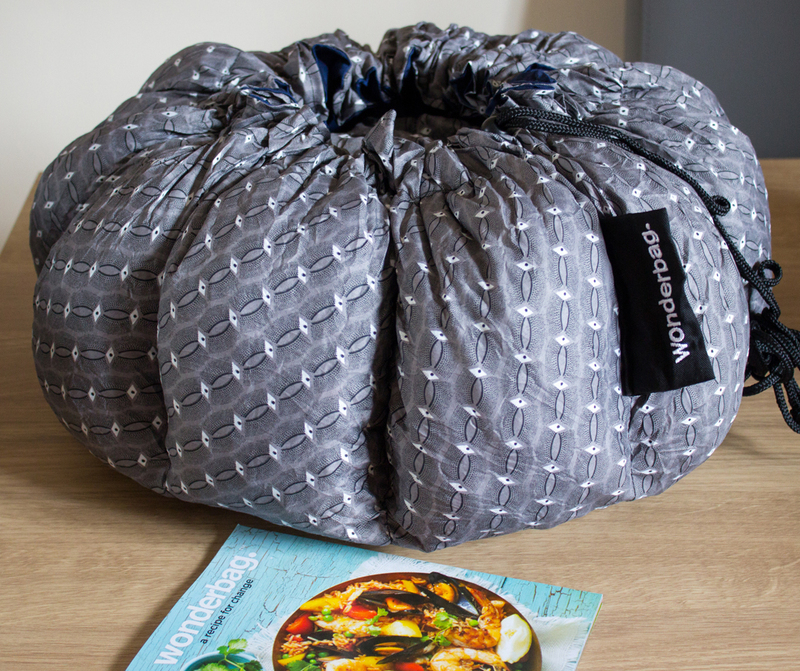 So, the Wonderbag looks like a big comfy bean bag but of course it isn't; it's an eco-friendly slow cooks that cooks and keeps food hot for up to 12 hours, but with a difference - there's no battery, plug or fuel required. 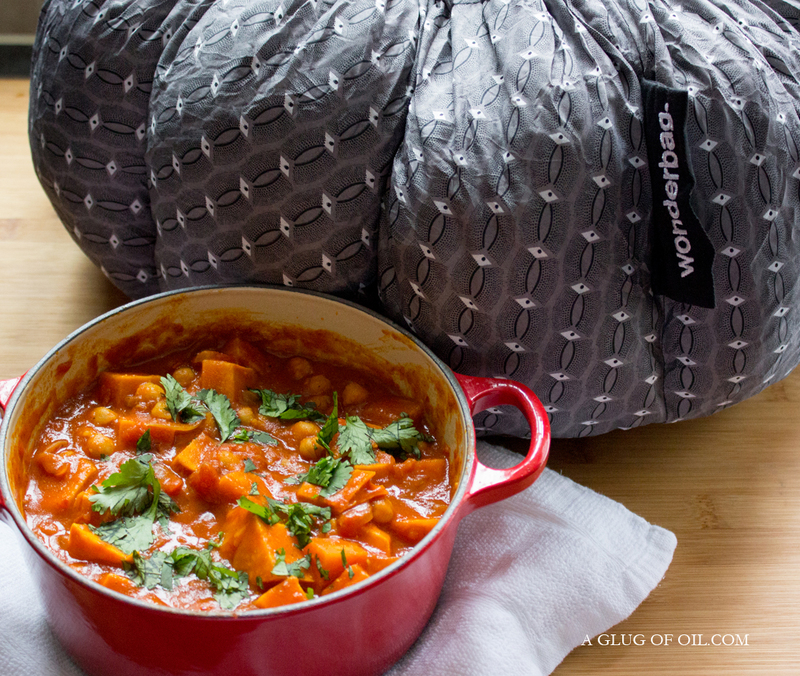 Check out my deliciously warming Sweet Potato and Chickpea Casserole - cooked in the Wonderbag! This was another of my experiments in the kitchen and it worked. The lovely warming spice cumin and honey go perfectly together but the addition of coconut milk gave the casserole a nice and creamy rich flavour; yep success. The Wonderbag is light in weight, easily portable and compact for easy storage when not in use. There's no need to supervise the cooking of your dishes and it will never overcook or burn your dishes. It even doubles as a cooler bag to keep food and drinks chilled as long as they went in really cold in the first place they will stay really cold. The recipe booklet that comes with the Wonderbag is one of the best I've seen. Usually when you get a recipe booklet with even some top brand kitchen appliances they are not too amazing but this one is excellent, with lovely looking and colourful dishes that really make you want to try them. But of course being a food blogger I wanted to make my own recipe and see if the Wonderbag was all it claimed to be. Before I forget to say and for anyone wondering, just because I chose to make a veggie meal doesn't mean you can't cook meat in it, you can cook meat, chicken or fish in the Wonderbag. In fact you can cook pretty much anything in it even yogurt. It's available in two sizes and in a variety of colours and patterns. It works simply by heat-retention so you must use a pot made from copper, steel, aluminium. enamelled cast iron, cast iron, or glassware with a tight fitting lid. Clay or ceramic post are not suitable. Bring your chosen dish to boiling point and simmer for a few minutes. Once your dish is inside the Wonderbag and the beanbag-like lid is in place you pull the draw cord tight and leave it alone. Only open the Wonderbag when you are ready to serve; so remember no peeking or dinner won't happen! The longer food stays in the Wonderbag the more tender it becomes. Many thanks to Wonderbag for sending one to review; I love it! As with any slow cooker method of cooking liquid doesn't thicken because there's no evaporation so you just need to add some kind of thickening. For example once cooking has finished, you can use cornflour dissolved in a tiny bit of water then added to the pot, although I'm a major fan of McDougalls Thickening Granules. 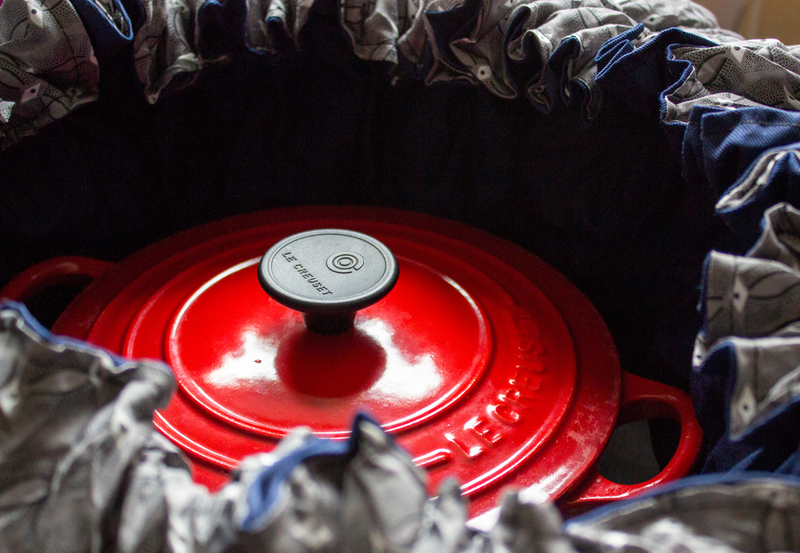 I used an enamelled cast iron casserole pot that can go directly onto the stove top to avoid loosing heat when ready to go into the Wonderbag. Place a tea towel in the bottom of the bag - just to protect it from spills. Add the oil to your cooking pot and throw in the sweet potato and onion. Stir to keep from burning and cook for a minute or so before adding the garlic. You can add a little more oil if you think it needs it. Add the tomato puree, cumin, cayenne and turmeric cook for a few seconds. Now add with the harissa, stock and tomatoes including their juice. Add the coconut milk and honey and stir well. Bring to the boil and allow to simmer for about 10 minutes before adding the drained chickpeas. Continue to simmer for a further 5 minutes or so until piping hot. Pop the lid on and put the casserole dish into the Wonderbag, making sure you also pop its beanbag-like lid on and pull the cord tight. Leave to cook by itself for at least five hours; I left mine for nearly six. When you're ready to serve chop the coriander, remove the dish from the Wonderbag and have a taste. Add sea salt and black pepper and thicken as mentioned above. If you think you need to add more honey or harissa do it now. Sprinkle with the chopped coriander with couscous or whatever you fancy. Disclosure: I received a Wonderbag to review. All thoughts and opinions are my own. I was not required to write anything positive. Never seen a technique like this before.Loved it!! Definitely wanna try it. Thinking of using Maggi chicken stock for this recipe. Thanks for your comment, isn't the Wonderbag a brilliant invention? !